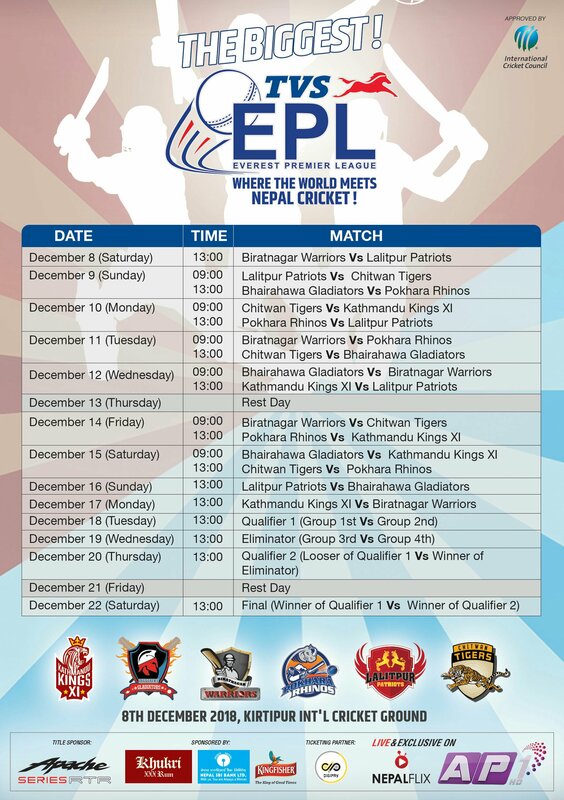 Defending champion Biratnagar Warriors to face Lalitpur Patriots as the opening match of most awaited TVS Everest Premier League 2018 (EPL). TVS EPL 2018 will commence on 8th December with 6 teams battling out for 15 days. Biratnagar Warriors, Bhairahawa Gladiators, Lalitpur Patriots, Pokhara Rhinos, Chitwan Tigers, and Kathmandu Kings XI will take on the field with a common goal of sealing the title. As per today announced schedule of the competition, Paras Khadka’s led Biratnagar Warriors will take on Gyanendra Malla’s Lalitpur Patriots on opening match of the tournament. Every teams will face each other once in group stage and top two teams will play Qualifier-1 whereas third and fourth placed team will play Eliminator. Winner of Qualifier-1 will ensure their place in the final and losing side will get another chance to meet Eliminator’s winner on Qualifier-2. Qualifier-2’s winner will find themselves on final match of TVS EPL 2018. Every matches will take place on TU Int’l Cricket Ground with live telecast on AP1 HD. We will have 2 rest-days, first on 13th December and second one before the final on 21th December.